No spouting some good solid theology or practical wisdom gleaned from a freezer waffle today. No cow-on-highway video either. Simple, straight up review today. We can't always be that impressive. It's tough to beat a fresh, cool, crisp salad for a good summertime dinner. And this being the Summer of All That is Mango at your local TJ's, it'd stand to reason that some sort of fruit/veggie mash-up just might be in the offering. 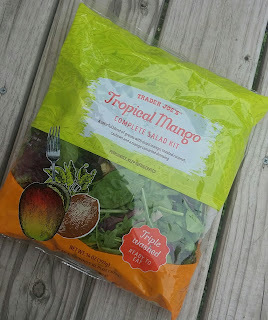 And so it came to pass with Trader Joe's Tropical Mango Complete Salad Kit. Like others in the bagged salad lineup, for $4.99, you get a huge bag full of the usual leafy greens (mainly arugula, spinach and baby lettuce) with some thin straw-slips of broccoli and carrots mixed in. Some other stuff like red cabbage tossed in too. All of that is the usual TJ's salad base, and as one would expect, fresh, crisp, and provides ample body while not being too other-worldly. No complaints. But that's not why we're here, is it? Oh no, not at all....what are the mix-ins!?!?!? And the dressing!!! That's what makes a salad fun, otherwise it's sad rabbit food. The mix-ins here include: cashew bits, toasted coconut chips, and, of course, dried mango chunks. The mango tasted of the slightly sweetened/candified lot, which added a slight air of artificiality, though not offensively. The real stand-out was the coconut (you can't label anything as "tropical" unless there's coconut involved, it's one the amendments, I think), though...for any and all of those crunchy bits, the salad rocked when there was some in my bite, but there wasn't enough. Get to work, Big Joe. Oh but the dressing...I'm not a salad dressing guy, usually. But the mango tamarind on here? AMAZING. Seriously. As the name implies, it's tangy, sweet, spicy, and vibrant...just try it. It needs to be sold by the bottle, and I mean like right now. 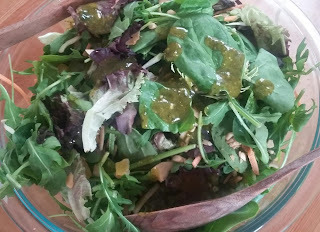 It's almost certainly the best salad dressing I've ever had, in recent memory at least, and any attempt to further describe it would be doing it a disservice. It's a huge salad, easily enough to for a couple adults to share for dinner, especially if some grilled chicken got tossed in. I'm not sure, but maybe some sort of mild goat cheese would probably pair well with it, if only an excuse to find a good bottle of wine as well. Look at me sounding so pseudo-fancy about bagged salad. Go me! Anyways, no hiuge complaints from either Sandy or I except: more mix-ins! And more dressing!!! Double fours. I passed on this because I don't like fruit in my salad, but maybe i should bend that stance. sadly, the mango salad dressing in the bottle is not the same as the one in this bagged salad. I agree with the author, the salad dressing is reason enough to buy the salad. What is most unfortunate, though, is that I am moving to a different state and they do not carry this product in said state. Actually, i checked every TJs I cam across in NM, WA, and OR and none of them carry this. I'm going to have to learn how to make it (which is how I came across this post by Google-searching the salad). 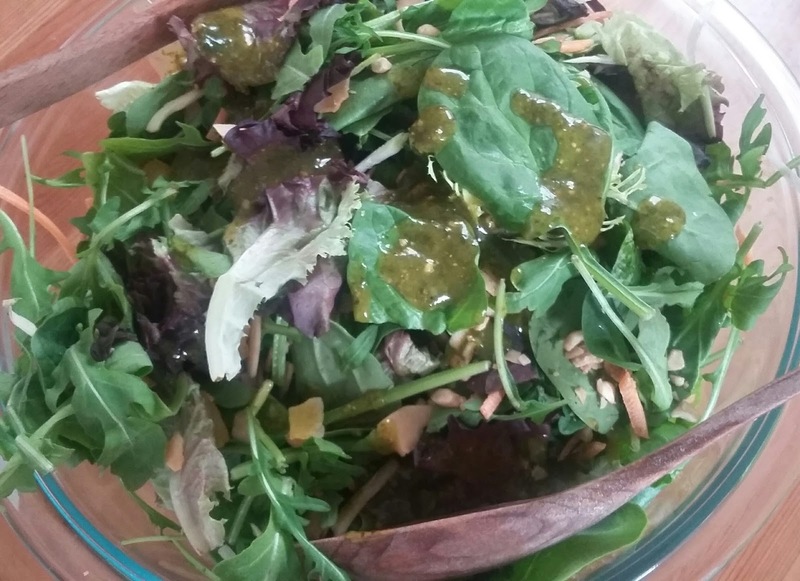 I'm not a fan of this salad because I don't like arugula,but other ingredients are good. The dressing isn't the same as the new refrigerated mango dressing. Too bad because this dressing is better, in my opinion. Now, for the mango craze. I bought something today that I never would have if I had not seen such positive comments about it. The mango/coconut caramel popcorn is AMAZING! No weird aftertaste. Each kernel is perfectly coated with a delicious flavor. I don't know if I'm glad I got it or not because I can see it easily becoming an addiction! It's probably limited so, if you're interested, try it soon. I'll be curious what you think.